Rendering of planned marijuana dispensary at 416 Boston Post Rd. in Marlborough. Marlborough – The City Council has approved a special permit for Garden Remedies, Inc., to open a medical and adult-use marijuana dispensary at 416 Boston Post Road, Route 20 (Marlborough Square Shopping Center). Garden Remedies has signed the lease for the 3,100 square-foot facility. Chief Operating Officer Jeff Herold said they have a building permit from the city and expect to start interior construction within the next few weeks. The dispensary’s location falls within the city’s pre-approved Business Zoning District on Route 20 that runs from the Sudbury line to Phelps Street. 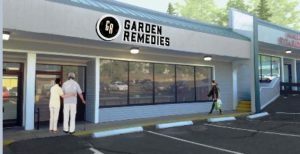 Garden Remedies currently runs a cultivation and a home medical marijuana delivery operation out of its Fitchburg location and has a retail medical marijuana dispensary in Newton. They have built another medical marijuana retail facility in Melrose. In Marlborough, Herold said he expects to employ 15 people. Hoping to open within the first quarter of 2019, Herold explained timing is contingent on the Massachusetts Department of Public Health approving medical sales at the location and the Massachusetts Cannabis Commission granting a license for recreational, adult-use, sales. The special permit for Marlborough includes details involving security, traffic and additional safety issues. Police Chief David Giorgi reviewed and provided input on Garden Remedies’ plan. The permit states that the dispensary will have tight security including, 24-hour video surveillance cameras and security personnel inside checking customer identification. Garden Remedies will pay for a city police detail for the first 60 days of operation unless the police chief finds the detail isn’t necessary at certain times of day. At the end of 60 days, the chief will decide if police detail needs to continue. The city projects approximately $500,000 in annual tax revenue from the dispensary which includes local sales tax and community impact fees.